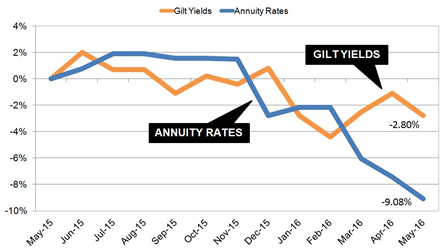 Providers of pension annuities have reduced rates by 9.0% over the last year, further than the fall in gilt yields at only 2.8% after the effects of Solvency 2 changes providers merger their business. Annuity rates have reduced by 9.0% over the last twelve months with significant decreases in December 2015 ahead of the changes introduced by EU legislation called Solvency 2. In addition since March this year rates have reduced further ahead of pension freedoms introduced in April and the merger of Just Retirement and Partnership Assurance. These reductions have exceeded the falls in the 15-year gilt yields that have only reduced by 28 basis points over the last year. As annuity rates are mainly based on the yields we would have expected a 2.8% reductions in annuities. The excess fall is mainly due to legislation changes and market re-structuring following pension freedoms as well as lower industry competition. Rates reduced in December 2015 ahead of Solvency 2 followed by a fall in gilt yields back to their all time low in February this year. Since the merger of Just Retirement and Partnership Assurance these leading providers have significantly reduced their lifestyle rates to the wider market contributing in the recent continued decline of rates. The above table shows how the standard annuity rates increased during the summer of 2015 after pension freedoms were introduced and providers of enhanced annuities extended their lifestyle rates to the wider standard annuity market. 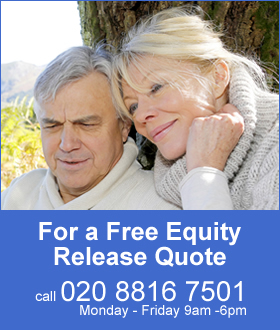 For our benchmark of a person aged 65 years old with a fund of £100,000 buying a lifetime annuity on a single life, level basis could purchase an annuity in May 2015 with an income of £5,738 pa. This has reduced by £521 pa to £5,217 pa now. Over the lifetime of the annuitant and based on the Office of National Statistics (ONS) we would expect a male to live for 17.3 years and he will have £9,013 less over his lifetime. For a female she can expected to live for 20.4 years increasing her income by £10,628. Annuity rates have reduced further than would be expected and should improve with a rise in gilt yields and interest rates at some point in the future. For a low risk alternative you can consider a fixed term annuity allowing you to select an income and term for the plan. A five year plan would allow you to vary the income you take from nil up to the initial amount selected. Any income not taken accumulates in your account until it is needed without the deduction of tax. A guaranteed maturity amount is available at the end of the term when you can consider all options again such as an annuity from any provider, flexi-access drawdown, taking the fund as cash less tax. Also useful to consider for those that can accept a higher level of risk is flexi-access drawdown allowing you to take your tax free lump sum now and leave the remaining fund invested, take an income, a lump sum or even contribute to the fund.